Egads, a gull. Double egads, an immature gull. Triple egads, a large immature gull. Identifying large immature gulls can cause fear and teeth gnashing, and for good reason - large gulls frequently hybridize and their immature plumages are variable. With that caveat in mind let's jump in and tackle this troublemaker. For starters, note that the gray of the upperparts is medium gray. This medium gray color is too dark for Herring, Thayer's, and California Gulls so out they go. Obviously then we are dealing with one of the so-called "dark-backed" gulls, four of which have been recorded in Illinois: Western Gull, Slaty-backed Gull, Great Black-backed Gull, and Lesser Black-backed Gull. Before we get too far though we should probably try aging this bird, since aging a large gull can provide clues to its identity. The back, scapulars, and wing coverts are a mixture of brown and gray. The tertials have obvious dark centers. The underparts are largely white with some dark spotting on the sides. The folded primaries are dark brown and lack white apical spots. All of these features suggest that our candidate is most likely in its second cycle. Back to business. A Western Gull would have a heavier bill and would be bulkier, with a more prominent tertial step. Our bird is rather slim and long winged and lacks a prominent tertial step. A Slaty-backed Gull would also possess a more prominent tertial step, and at this age would have whitish wing coverts. A Slaty-backed would probably also have legs that are brighter pink in color. The legs of our candidate look fleshy pink in color. Moving on, Great Black-backed Gulls of this age would have much more contrasty upperparts, the familiar checkerboard pattern of first and second year GBBGs. The bill and proportions are also wrong for a Great Black-backed Gull. By elimination that leaves Lesser Black-backed Gull, which is what this bird is. 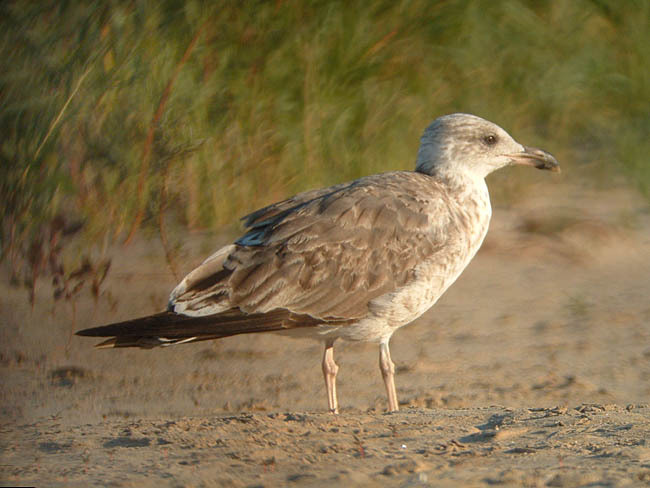 This Lesser Black-backed Gull was photographed at Montrose Beach in Chicago, Illinois on July 3, 2005.